Hannah and her sister Sarah have just experienced the horrors of a London struck down with the plague, but they have luckily been able to flee, taking an orphaned baby girl with them. After a long and horribly uncomfortable journey, the sisters finally arrive at the sumptuous and enormous home of the baby's aunt, a certain Lady Jane. Unfortunately they are not greeted with the expected open arms but are instead sent to the pesthouse, a form of quarantine which was both miserable and dangerous. In a trice the sisters and the baby find themselves in the most awful place surrounded by the sick and dying, by filth, and hopelessness. There is one thing that can be said for Hannah and Sarah, and that is that they are survivors, tough and determined to get through whatever ordeal life throws at them, and just as they managed to survive the plague within the walls of the city of London, so too do they manage to emerge from the pesthouse alive and well, if maybe a little flea-bitten and in need of clean clothes and a bath. Soon enough the sisters are heading for their parents home in the country and though Sarah is happy to stay there a while, Hannah us eager to get back to the Sugar Plum, the shop she and Sarah ran in London. She is also very keen to be reunited with her 'sweetheart', the apothecary's assistant, a young man called Tom. Just before the plague broke out Hannah and Tom became very close and she misses him dreadfully. So, being the determined young lady that she is, Hannah is soon back in London. With her is not her elder sister Sarah, but her younger, and seemingly flighty sister Anne. London appears much changed to Hannah's eyes, and worse still, she is told that her Tom died in the plague. Just as she is reconciling herself to this awful discovery and getting the sweet business back on its feet Hannah sees a young man who looks very like Tom. Can he be alive after all? The story of Hannah, Tom, and Anne slowly unfolds against the backdrop of one of London's most historic events, the Great Fire of 1666. The terror, chaos, and danger that surrounds the three young people is hard to imagine, and yet and the author of this superb, and gripping, book beautifully captures their experiences and emotions. 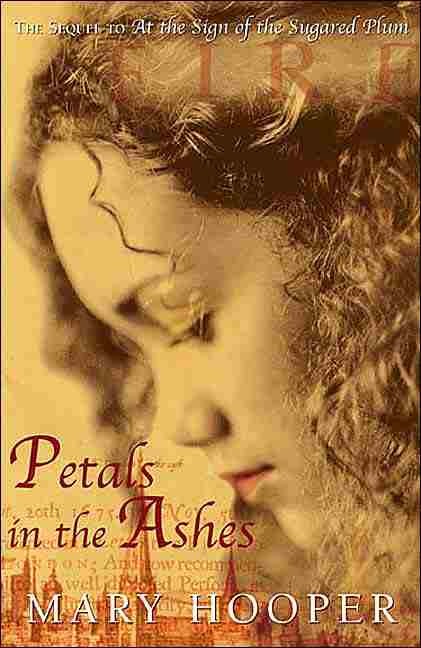 A seamless sequel to "at the Sign of the Sugared Plum," "Petals in the Ashes" does much to show us what true courage looks like, and how strong the human spirit can be in the face of terrible hardship. "Petals" is hard to put down and full of gentle humor despite the grim nature of Hannah's world.